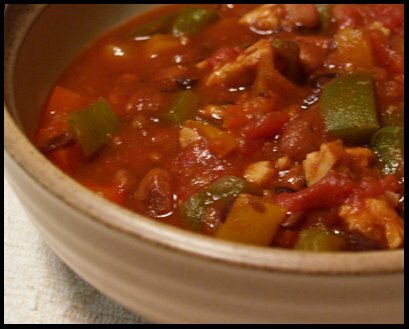 A new friend of mine made this veggie chili for a holiday potluck I attended in December. 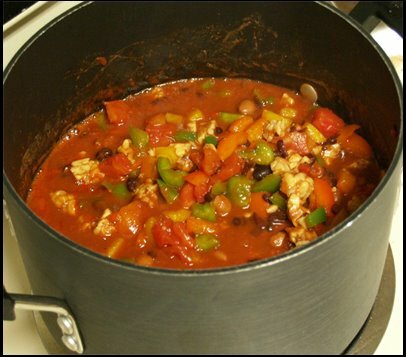 The chili was sooo good that I emailed her to get the recipe and try it out myself. Turns out she doesn’t really follow a recipe, but kind of makes it up as she goes. However she was happy to give me a list of the ingredients and approximate amounts. I made some slight adjustments when I made it for dinner last night, but I’m very happy with how it turned out. It was delicious. You can throw this all into the crockpot and let it cook throughout the day. I didn’t have time for that since I didn’t start dinner til 5, so I put it into a large pot. I cooked it on the stovetop over medium-high heat for about 30 to 40 minutes, until the peppers softened. 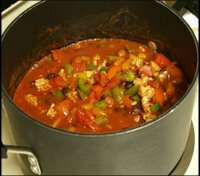 I found the chili to be quite thick, so I added in a cup of water at the end to thin it out. It makes about 6 or 7 servings. The only thing wrong w/ the ‘6 or 7 servings’ is that you want to eat em all up in one setting. How many helpings did Amy have? I’ll never tell. That looks amazing. I’ve been contemplating making chili for a couple days and this seems to have sealed the deal…keep posting great photos! Holy cow does that look good! I may have to try this! Nelly – Thanks! It’s reallllly good. This looks amazing! I, as Miriam, have been seeing Chili everywhere and have been pondering making some, I think I will…another dish is Goulash…hope to make that for dinner tomorrow. This looks absolutely delicious. I make chili every week in the fall and winter. It is great to see old ingredients that I’d forgotten about. 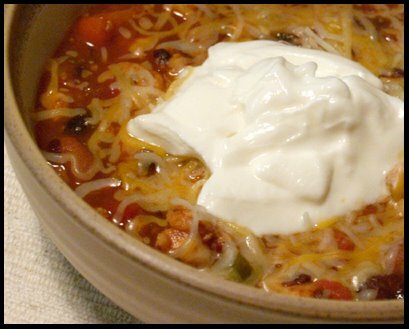 Mix a few cans of beans with your favorite salsa and chili powder. Quick and easy.